Standard Proctor Test; Its Apparatus, Procedure, Result. 5.The Result of Soil Compaction Test. 6. Q & A about Standard Proctor Test. Standard Proctor Test is used to determine the compaction of different types of soil and the properties of soil with a change in moisture content. In this article, you’ll know Standard Compaction Proctor test in details from Apparatus, Theory, to Result and much more. Compaction is a type of mechanical stabilization where the soil mass is densified with the application of mechanical energy also known as compactive effort. The mechanical energy may be produced by the dynamic load, static load, vibration, or by tamping. During compaction, the soil particles are relocated, and the air volume is reduced. It may also involve a modification of the moisture content, and in the saturated coarse-grained soil, moisture content may be pressed out during the process of compaction. where the density of saturated soils is increased due to a reduction in the volume of voids brought about by the expulsion of water under the application of static load. 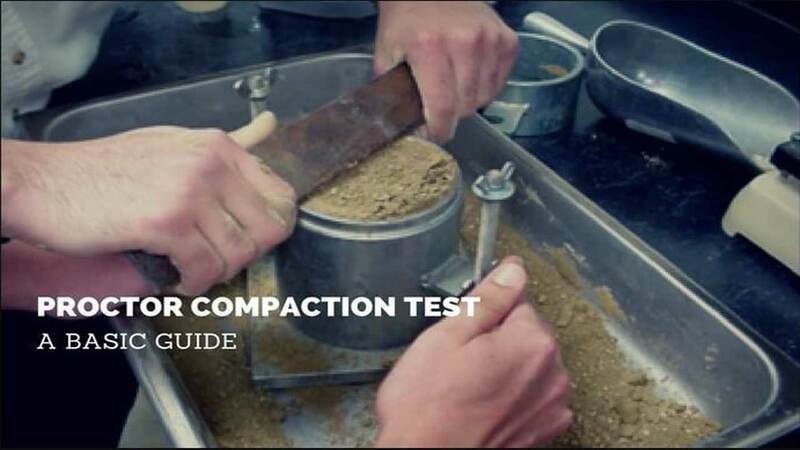 the standard laboratory compaction test which is developed is commonly called the Standard Proctor Test. 4. Dry density of the soil. Soil type and Moisture content. For a given type of soil and compactive effort, the dry density of a soil mass varies with moisture content. At low moisture content, the internal friction and adhesion between the particles contribute to the resistance to compaction. As the moisture content increases the particles develop moisture films around them, which help in lubricating the particles, thus increase the workability of the soil mass. as the water at this stage starts replacing the soil particles and as the unit weight of water is less than that of soil particles the density starts decreasing. 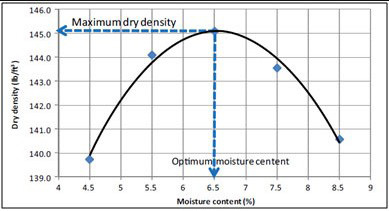 The particular value of moisture content at which maximum dry density of a soil mass is attained for a given compactive effort and is known as the optimum moisture content (OMC). Both the magnitude of compacting energy and the type of compactive effort influence to a greater extent the compaction of soils. Cohesion less soils are efficiently compacted by Vibrations in the field hand operated vibrating plates, and motorized vibratory rollers of various sizes are used for compaction of sand, gravel, etc. Rubber-tired roller (pneumatic roller) can also be used for this purpose. Even large free falling weights have been used to dynamically compact loose granular fills. 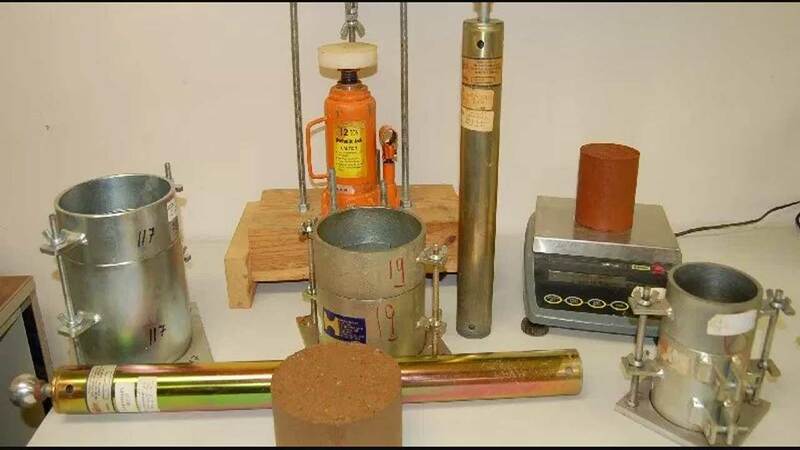 Fine-grained soils may be compacted in the laboratory by falling weights and hammers (rammers) by special kneading compactors, and even under static pressure applied by compression machine. In the field, sheep foot rollers, rubber-tired rollers and other type of heavy compaction equipment including hand tamper may be used. 3. BS1377: Part 4; Clause 3.
and the mold should have detachable base plate & collar of 2 inches (5.08 cm). 2. Rammer, weighing 5.5 lbs (2.5 kg) & having fall of 12 inches (30.5 cm), with a flat circular face of 2” diameter. 3. Sensitive Balance, sensitivity ranging from 0.1 gram to 1 gram. 10. Mixing tools. (spoon, trowel, spatula). Read Also: Particle Size Distribution of Soil by Sieve Analysis. 1. Take sufficient quantity of representative soil, air dry & pulverize it with a rubber mallet. Sieve the soil through No: 4 sieve & reject the coarser material. 2. Take about, 3 kg of soil, add water to bring its water content to about 5% below the estimated optimum moisture content. (for coarse-grained soil 4% initial water content & for fine-grained soil 10% initial water content is preferable). 3. Clean the mold, measure its diameter & height & weigh it without the collar. 4. Fit the collar & compact the moist soil in three equal layers by the rammer with evenly distributed blows to each layer. Use 25 blows for 4 inches diameter & 56 blows for 6 inches diameter mold to the total height of mold with collar. 5. Remove the collar trim the compacted soil even with the top of the mold with a straight steel edge. Clean outside of the mold & base plate & weigh it. 6. Remove the soil from the mold, split it & take about 100 grams sample for water content determination. 7. Break the soil lamps, mix it with remaining soil in the tray. Add more water to increase the water content by 2 to 3% & repeat the compaction procedure for each increment of water until the mass of the compacted soil decreases. 8. Calculate Water content for each trail & corresponding dry density. 9. Plot the compaction curve between water-content as abscissa & dry density as ordinate. 10. Note the water content against the peak of the curve as optimum moisture content & the corresponding dry density as maximum dry density. The wet Density or Bulk Density of soil is computed as: r = weight of compacted soil/volume of mold. After determination of moisture content of the soil, the Dry Density of Soil is computed as: rd = r / 1+m. Wt. of Cont: + Wet Soil. Wt. of Cont: + Dry Soil. The Maximum Dry Density of the Soil = _____________. The Optimum Moisture Content (OMC) = _______________. Q.1: What is meant by Compaction of Soil? Ans: Re-arranging of soil mass by mechanical means is knows as Compaction of Soil. 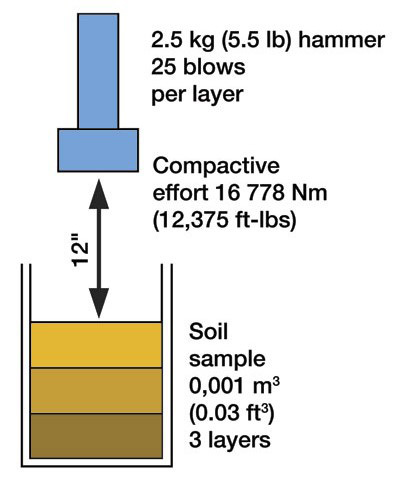 Q.2: Who presented this Soil Compaction Test and when it was presented? Ans: This Soil Compaction Test was presented by R.R Proctor in 1933. Q.3: The term OMC stands for? Ans: OMC stands for Optimum Moisture Content. Q.4: Define Optimum Moisture Content (OMC) of Soil. Ans: The Maximum Moisture Content at which the Maximum Dry Density of a sol mass is attained. Q.5: What was the Weight & Fall of the rammer used in this Soil Compaction Test? Ans: Weight of the rammer was 5.51 lbs and fall of the rammer was 12 inches (30.5 cm). Thank you for Reading this article. Please, Don’t forget to share it. Read More: Consolidation Test of Soil; Its Scope, Apparatus, Procedure.